Scientific evidence has proven that kindness changes the brain, impacts the heart and immune system, is an antidote to depression, improves relationships and even slows the ageing process. Yet more than this, kindness can power real and lasting change in the world. 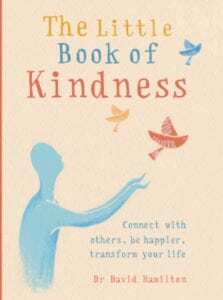 This little guide shows how the practice of kindness can increase your happiness, improve your health, help you to forge stronger connections with others and positively affect the world we live in. This book is beautifully illustrated and contains written content plus exercises, meditations and strategies, and a references page at the back containing a list of scientific references cited in the book. There is no longer any doubt that the way we think affects our bodies: countless scientific studies have shown this to be true. For former pharmaceutical scientist, Dr David Hamilton, the testing of new drugs highlighted how profoundly the mind and body are connected. Time and time again, the control group of patients in drug trials improved in similar ways to those who actually received the medicines. Astounded, he decided to leave the industry to explore the relationship between the mind and the body. This bestselling acclaimed book was first published 10 years ago. In it, Dr Hamilton explores the effect of visualisation, belief and positive thinking on the body, and shows how using our imagination and mental processes can stimulate our own defences and healing systems to combat disease, pain, injury and illness. In this new edition, Dr Hamilton has added four new chapters to discuss the latest cutting edge information and extraordinary new techniques. These include using imagery to stimulate the immune system – a method that can benefit cancer patients undergoing conventional treatment – effectively using the mind to speed up rehabilitation from stroke, and powerful visualisation strategies to enhance sporting performance, and facilitate recovery from injury, illness and disease. Did you know that performing acts of kindness lowers your blood pressure? Or that kindness has the power to relieve depression, boost self-esteem and reduce social anxiety by physically changing the brain? Kindness also slows the ageing process by reducing wrinkles and promoting muscle regeneration. As if that wasn’t enough, kindness can increase the chances of our relationships lasting, cure stress and make our lives happier overall. In his latest book, The Five Side Effects of Kindness, former chemist David Hamilton shares the scientifically proven health benefits of kindness and how they can transform your life. This unique book fuses scientific research around being kind with inspirational real-life examples of kindness from ordinary people. Reading these stories will nourish your soul and leave you with renewed optimism for the future, and this book will help you see the many ways in which giving your time, energy and love to another could transform your health – and your whole world. How much love do you have for yourself? Not the narcissistic ‘Aren’t I wonderful’ kind of love, but the essential regard for self that empowers you and helps you navigate through life. The type of love that enables you to feel safe and secure in who you are and inspires you to make choices that are good for your authentic self.
. that gratitude can make you at least 25% happier. This unique book fuses scientific research around being kind with inspirational real life examples of kindness from ordinary people. Reading these stories will nourish your soul and leave you with renewed optimism for the future, and this book will help you see the many levels on which taking the time to make a difference could transform your health – and your whole world.
. and how your best friend’s sister’s hairdresser can make you fat! In this book, Dr David Hamilton explores the amazing implications of this phenomenon and suggests that a small group of committed people really can change the world.
. how our thoughts and feelings affect how quickly we heal. These are questions we all ask ourselves, but it’s hard to get past conjecture or gut feeling to find any definitive answers. Now, in this ground-breaking book, David Hamilton looks at hard scientific evidence to bring us closer to understanding the balance between the forces of destiny and the power of free will. Exploring new, cutting-edge scientific research into the nature of time, and drawing on fields such as quantum physics, epigenetics, solar cycles and even reports of near-death experiences, David explores how, rather than being a question of one versus the other, destiny and free will can in fact work simultaneously in his fascinating new theory, ‘The Tree of Probable Life’. He shows how, ultimately, we create many of the conditions of our own lives and offers some powerful, practical principles that can bring amazing results. At this moment in history we’re faced with one of the biggest choice points we have ever encountered. Individuals are making choices to change their nations, nature is giving us a wake-up call, economies are struggling, and for many of us the future looks uncertain. Yet people are also rallying to have a voice, awakening from their apathy of previous decades. Collectively and individually, we are being given the opportunity to make extraordinary choices in order to change where we are headed. Based on the groundbreaking film Choice Point (available on iTunes), which features insights from some of the world’s leading change-makers, authors and scientists, including Archbishop Desmond Tutu, Sir Richard Branson, Tony Benn, James Caan, Arielle Ford, Gregg Braden, Harry Massey, Dr David R Hamilton, Vlatko Vedral, Larry Dossey MD, His Holiness the Gyalwa Karmapa and many others, this inspiring book reveals exclusive material not seen in the film, and explores its exciting discoveries in greater depth. It shows you how to understand your world like never before, how to align your own true purpose with the patterns of the universe to enable you to take your potential to the next step, and finally, how to be the change that you want to see in the world around you. This CD contains a lecture approximately 40 minutes long followed by a 17-minute Quantum Field Healing guided visualisation. Quantum Field Healing is a visualisation process that guides you through the layers of biology (cells, DNA, atoms, subatomic particles) to imagine an illness, injury, or disease from a quantum perspective instead of a physical perspective. In this live lecture, Dr David R Hamilton discusses some of the science that explains why we attract what we place our attention upon and he shares 7 powerful principles for harnessing the way thoughts and emotions attract that can help you to get the things you want in life.